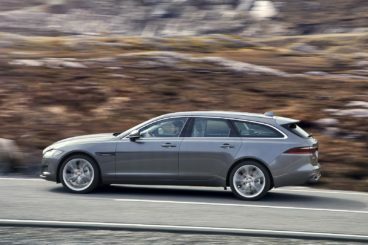 The new Jaguar XF Sportbrake makes owning a large estate car exciting. Although it’s not available with the monstrous V6 engine that’s seen on the continent, it’s still a powerhouse lifestyle car that’s practical and good to drive. It’s also the left field choice in a sector of the market that’s traditionally dominated by the big German brands. However, its interior is starting to look dated, and this might count against it. OSV takes a closer look at what it’s all about with our 2018 Jaguar XF Sportbrake review. In some ways, it’s a bit of a shame that Jaguar has decided not to sell the XF Sportbrake with the V6 supercharged petrol engine on our shores. It develops 375bhp and it’s an absolute monster. However, due to the poor economy, the brand realised that it would sell poorly. Instead, there’s just one petrol engine available to British buyers. This is a brand new 2.0-litre unit that develops 247bhp, and which has a 0-62 time of 6.7 seconds. Top speed is 155mph. These are exciting numbers, especially for such a large estate car, but the petrol doesn’t have as much punch as the diesels. Moreover, when you put your foot down, it does get a bit noisy. Opting for a rear wheel or four-wheel-drive system doesn’t really impact how the car drives. Specifying four-wheel-drive makes the car a bit heavier, but both versions have been designed to drive a lot like the smaller saloon variant. The four-wheel-drive system is meant to divide power 50/50 between the rear and front axles, but most of the time it’s a rear-wheel driven car. The only time power is split is when the XF loses traction. A self-levelling air suspension setup is standard on all models, and it helps to maintain the XF’s composure. There’s lots of grip on offer – although the four-wheel-drive variant is able to offer extra grip – and body lean is well managed. In corners, the car feels nicely poised. Weight distribution is good and helps the car to feel balanced and agile in corners, too. All models come with Intelligent DriveLine Dynamics, which eradicates understeer so that you can take bends with pace and not have to worry about losing power. Adaptive dampers, meanwhile, are available as optional extras. Inside, the XF Sportbrake looks like a lot like the smaller saloon model on which it’s based. The problem with this is that, like the saloon, the XF Sportbrake’s plastics aren’t as rich in quality as the ones used in its German rivals. The ergonomics are fine, however, but the drive mode selector should have been positioned further forward. We have no complaints about the driving position – it’s excellent and gives the car a sportier feel. There’s plenty of tech inside the cabin, with buyers able to choose between a brand new 10.2” InControl Touch Pro touchscreen and an 8” InControl multimedia system. Both systems are a big improvement on what was here last time. Also included in the cabin is a full-colour, crystal clear head-up display. Comfort levels are high, as are insulation levels. That said, the petrol gets noisy at higher speeds and will intrude. Is the Jaguar XF Sportbrake practical? 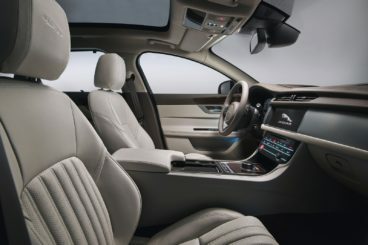 With lots of clever functions available, such as Tow Assist tech, Activity Key and 40:20:40 split folding rear seats, the XF is highly practical. There’s plenty of interior space for all – more than last time – but without parking aids, this is going to be a tricky car to park. Just make sure you pick your spot wisely. Storage spaces are par for the course and include a well-shaped and reasonably sized glove box, while the boot measures 565-litres. That’s competitive for this class, although there are rivals that can offer bigger boots. Fold the rear seats and you can extend it to 1,700-litres. Standard kit is good across the range. The entry-level model comes with 17” alloys, rear parking sensors, sat-nav, ambient interior lighting, a leather sports steering wheel, a rear armrest complete with cup holders, heated front leather seats and LED daytime running lights. The Portfolio model adds 18” alloys, a rear parking camera, front parking sensors, power folding door mirrors, keyless entry and start, heated front windscreen, a Meridian sound system with eleven speakers, ebony veneers and a leather instrument panel. The R-Sport model is next and nets you front parking sensors, gloss black window surrounds, sports seats, sports suspension and sports pedals. Rounding off the range is the S trim which comes with adaptive dynamics, red brake callipers, 19” alloys and an S body kit. In terms of how safe the car is, the XF Sportbrake hasn’t been crash tested by Euro NCAP. The saloon on which it’s based scored 5/5, and we think that’s reason enough to suggest that this would be a very safe car, too. Standard safety kit includes lane keep assist, lane departure warning and autonomous emergency braking. Prices for the new car start out from £28,295 and rise to £40,775. For more information on our leasing deals, you can check out our page here. In terms of its running costs, there’s only one petrol engine available, with Jaguar deciding to withhold the massive V6 supercharged engine from British dealerships. As it is, the sole petrol unit is able to return 41.5mpg at best and emits 154g/km of CO2. That gives it a BiK rating of 29%. Those numbers aren’t too bad, but if fuel consumption is a priority of yours, you’ll need to take a look at the diesels, which we’ve reviewed separately. Insurance-wise, the car starts out from group 25. There’s a menacing aspect to its looks that ensures it stands out from the crowd. Fortunately, its exciting aesthetics are matched by excitement behind the wheel. It’s more spacious than last time and is a genuinely usable premium car. Once you start sniffing around the optional extras, the price can soar. It’s good but not as modern as rivals. Let’s see how the car fares against its rivals in the comparison section of our 2018 Jaguar XF Sportbrake review. 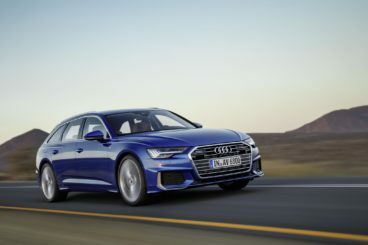 The new Audi A6 Avant is a smooth looking – and driving – thing. It’s got an image, space and a great line-up of engines. On the road, you don’t always expect large estate cars to excel, but while the Avant won’t excite you it’s an excellent motorway cruiser. It eats up the miles with ease and always feels reassuringly composed and safe. We’d prefer it if the steering offered a bit more feedback but a new aluminium body means it’s lighter than last time, and thus easier to drive. In terms of its engines, there are two diesels available. A 2.0-litre TDI ultra kicks things off with 187bhp. It has a 0-62 time of 8.7 seconds if you stick to the manual and 8.5 if you opt for the 7-speed automatic ‘box. We like the automatic transmission – it’s an excellent engine. A 3.0-litre TDI diesel rounds things off. It’s available in two separate power guises, with the smaller of the two developing 215bhp. That’s enough to get you from rest to 62mph in 7.3 seconds if you specify four-wheel-drive, but in two-wheel-drive form, it completes the same sprint in 6.8 seconds. A ballistic 268bhp variant, meanwhile, does the 0-62 dash in 5.7 seconds. Running costs? The 2.0-litre engine is naturally the most economical and emits just 114/km of CO2 if you stick to the smaller wheels. It returns as much as 64mpg, too. Inside, the car is comfortable and very well insulated. Wind and road noise is well suppressed and buyers will appreciate the supportive leather seats. The S Line model isn’t as comfortable, though, thanks to its lowered sports suspension and bigger alloys. The materials used in the cabin are of a very high quality, fit and finish is excellent and the controls are logically positioned. Meanwhile, an MMI control system ensures there’s no button clutter issue here. Is the Audi A6 Avant practical? Measuring nearly 5 metres, it’s a very spacious car indeed. Of course, the worry with such a large car is that it will be hard to park. For this reason, we recommend snapping up the numerous optional parking aids. Rear headroom is good and two adults will be able to sit in comfort on longer trips back there. Three can fit in, but a big bump in the floor will make life hard for anyone sat in the middle. The boot measures 565-litres and can be extended to 1,680-litres by folding the rear seats. The new Mercedes C-Class Estate is suave and sophisticated, but also a great family car that’s super practical. It’s also one of the most comfortable cars around that offers a very relaxed driving experience. Air suspension is available as an optional extra if you want to enhance its comfort levels even more, but it comes with a Comfort mode that causes excess body lean in bends. However, the system isn’t available for entry-level models. The standard comfort suspension is acceptable, of course, but once you’ve tried the air suspension setup you’ll really notice the difference. In terms of its engines, the C200 is powered by what sounds like – on paper at least – an underpowered 1.5-litre turbocharged petrol engine. Its turbocharger does give it a bit more oomph, and the engine develops 195bhp and can get you from rest to 62mph in 7.9 seconds. Four-wheel-drive is available but specifying it alters its 0-62 time to 8.4 seconds. A C300 model is also available with a 2.0-litre 255bhp engine. This is a rear-wheel-drive model that completes the 0-62 dash in just 6.0 seconds flat. 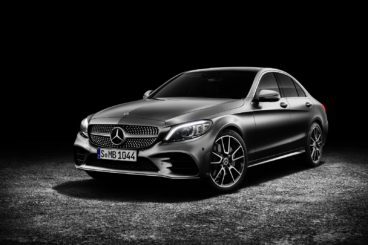 Rounding off the range is an AMG C43 monster that’s backed by a ferocious twin-turbocharged 3.0-litre V6 engine. 0-62 is dispensed within 4.8 seconds, a time that sounds faintly ridiculous for a family estate car. Running costs? The C200 benefits from EQ boost technology to keep costs down. In layman’s terms, it’s a mild-hybrid setup that preserves what would otherwise be wasted energy. Accordingly, the engine can return as much as 44.1mpg and emits 142g/km of CO2. The C300 is more powerful but hardly any more uneconomical. It returns 41.5mpg on a good day and emits 150g/km of CO2. Inside, the C-Class is impeccable. Top notch gloss-black surfaces are standard on all models, as are satin chrome highlights. Comfort is okay on entry-level models but the Sport trim gets a firmer setup. Adding air suspension will really benefit you. The dashboard comes with a colour screen that sits in the centre, while a touchpad is a clever touch that works a bit like a smartphone. Is the Mercedes C-Class Estate practical? There are bigger estate cars out there, but for its size, this is a really practical family car. It’s longer than last time, rear legroom is better, but it’s well worth adding parking aids such as the reversing camera. The boot, meanwhile, measures 490-litres, which is competitive for this class. Fold the rear seats and you can extend it to 1,510-litres. At one point it looked as though Jaguar were walking away from the estate sector, but they’re back with a bang and a flourish. The new XF is a proper rival to the German establishment; it looks great, drives superbly and offers pace and power. It falls short of the Germans in a few areas, but if you’re already a fan of the brand the new Jaguar XF Sportbrake it’s an awesome car in its own right.